As a photographer I am captivated to explore the world through a filter. Life can be beautiful, but the imagined always absorbs me. I was born in Finland December 1986 and grew up on the countryside of Ekenäs. My interest in art started at an early age, but it was not until I served the Finnish Marines between 2008-2009 that I fell in love with photography. Photography to me is a way to express and stimulate my imagination. Nature is simply the world. With alternative and experimental camera techniques I am able to create art that otherwise would only be possible through painting or digital manipulation in an external software. My goal as an artist is to be true to who I am, and aim to create work that will stay around for its good cause. 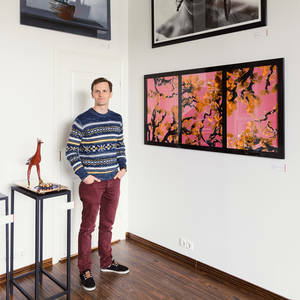 I work as a full-time photographer with gallery representation in USA, Asia and Europe. I have done commissions for national as well as international clients including: Adobe, Nikon, Oxford University Press and the Finnish Forest Industry. My work has been published in notable publications and websites around the globe such as: LA Times, Oprah.com, Huffington Post, China Daily, Mashable and Colossal. All commissions considered, nothing is too great or small. To get in contact please email me for further information.